Kristen Stewart is an American actress and director, known best for her portrayal of Bella Swan in The Twilight Saga and as Snow White, she will appear in the 2019 adaption of Charlie’s Angels. She was listed as the highest-earning female actress in the Vanity Fair ‘Hollywood Top Earners List of 2010′, with an estimated net worth of $28.5 million. In 2011, she was named number one on Forbes’ list of ‘Hollywood’s Best Actors for the Buck’. Forbes also named her as the highest-paid actress in 2012, with total earnings of $34.5 million. She is the ‘face’ of Chanel and Balenciaga fashion brands. Kristen Jaymes Stewart was born in Los Angeles on April 9, 1990, to parents working in show business. K-Stew began her acting career in 1999 with uncredited roles and a minor character appearance in several films. Her father, John Stewart, is a stage manager and television producer who has worked for Fox and on the Comedy Central show @midnight. Her mother, Jules Mann-Stewart, is originally from Maroochydore, Queensland, Australia and is a script supervisor and has also directed a film, the 2012 prison drama K-11. How did Kristen Stewart become an actress? Stewart appeared in the fantasy-adventure film Zathura: A Space Adventure (2005), playing the role of Lisa Browning, the irresponsible older sister of two little boys. During their playing a board game, they turn their house into a spacecraft hurtling uncontrollably in outer space. The film was praised by critics, but Stewart’s performance did not garner much media attention. Her character is immobilised during most of the film. The next year, she played the character Maya in Fierce People (2006), directed by Griffin Dunne. After that film, she received the lead role of Jess Solomon in the supernatural thriller film The Messengers. Did Kristen Stewart cheat on Robert Pattinson? Yes. In 2012, shocking photos emerged of Kristen Stewart cheating on Twilight co-star and real-life boyfriend Robert Pattinson with her married Snow White and the Huntsman director, Rupert Sanders, the Daily Mail reported. No. Kristen is linked to Stella Maynes Maxwell, a New Zealand model known for being a Victoria’s Secret Angel and the face of Max Factor. 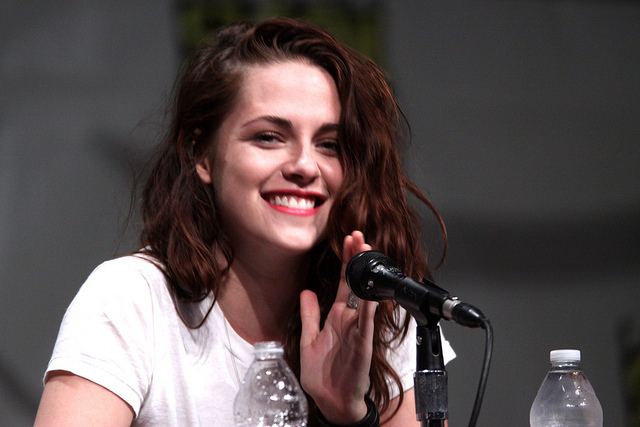 How much money did Kristen Stewart make from Twilight? For the last two Twilight films, Stewart reportedly demanded an estimated $12.5 million per film, plus a share of the profits. Her two co-stars, Robert Pattinson and Taylor Lautner, get paid the same, but Stewart earned more than them that year because of Snow White and the Huntsman. What films does Kristen Stewart star in? Kirsten gained notice in 2002 for playing Jodie Foster’s daughter in the thriller Panic Room, which garnered her a Young Artist Award nomination for Best Leading Actress in a Feature Film. She went on to star in Speak (2004), Catch That Kid (2004), Zathura: A Space Adventure (2005) and Into the Wild (2007), for which she received a Screen Actors Guild nomination for Outstanding Performance by a Cast in a Motion Picture. She received widespread recognition in 2008 for playing Bella Swan in The Twilight Saga film series (2008–12), which grossed over $3.3 billion worldwide.